Snooker is played in the head as much as on the table, so the sport's great and good will often explain. Two-time world champion Mark Wiliams returns to the Crucible for this year's tournament, after a one-year absence and an impressive return to form, safe in the knowledge that he has that side of things mastered. His laid-back approach means he is highly unlikely to let the demons that have crushed many a dream affect him. "If I lose in any competition, it never worries me," the 40-year-old told BBC Sport. "It just doesn't bother me. What's the worst that can happen? "You miss a ball and lose a frame or a game, but there's no point in moaning or getting in a state." 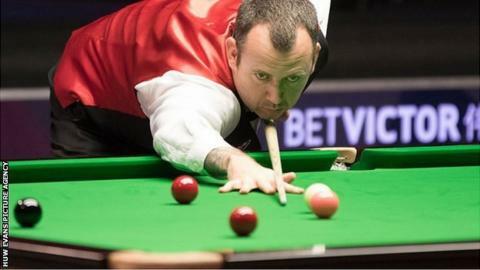 Williams takes on world number 35 Matthew Stevens in his first-round match on Tuesday. Williams and Stevens have met 15 times since Williams beat his fellow countryman 18-16 in the 2000 World Championship final, with Stevens only winning on five occasions. And the prospect of facing a fellow Welshman in his opener was as close as Williams came to getting animated during an interview just before the draw was made. "I want to avoid the other Welsh boys for obvious reasons," he explained. But beyond that, he was not fazed. Cue an almost inevitable match-up against Stevens who, along with Williams, is one of four Welshman to make it through to the Sheffield showpiece. World number 14 Williams has fond memories of his last World Championship meeting against qualifier Stevens - the man he beat to win his first world title in 2000. But although he says he struggles to recall previous matches from a career that has brought 18 ranking event wins, Williams still has the required desire and drive and is relishing the chance to head back to the Crucible. Having missed out in 2014, the first time since his debut appearance in 1997, Williams is proud to be back. Last season he finished as the world number 18, the first time he ended a campaign outside the top 16. Many, Williams included, wondered if he was on a slippery slope, but the current World Seniors champion has impressed in recent months - even though he is adamant his best days are well behind him. "I have got to the stage where, at 40 years old, I am not going to get any better," he added. "But I have accepted that and results have been pretty good this season." Since February, they have been excellent. He has reached semi-finals at the Welsh Open and the Indian Open and made final appearances in Poland and at the Players Championship. All of which meant he did not have to qualify for Sheffield. "Getting back in the top 16 in the world was a little bit of an achievement," said Williams. "I was confident that if I put in the practice, I could do that. "Last year I was watching it and was pretty relaxed, but it was my aim to get back here and now I want to enjoy it. This could be my last time. "Deep down maybe I realise I won't win another tournament, but only 12 months ago people were completely writing me off, saying I was done, so I will see how I get on." Whatever the outcome, the Williams-Stevens tie does guarantee one Welshman in the second round. But Ebbw Vale-born Williams has concerns that the next generation of Welsh stars are not coming through. Mark Williams is one of only three players to have won snooker's triple Crown of the World Championship, Masters and UK Championship in the same season. Steve Davis and Stephen Hendry both managed the feat before Williams joined them by winning all three in the 2002-3 season. Terry Griffiths, Alex Higgins, Davis, Hendry, John Higgins, Ronnie O'Sullivan, Williams and Neil Robertson have all completed snooker's hat-trick during their career. He offers world number 16 Michael White, 23, as the obvious exception, and also mentions 27-year-old Jamie Jones. "I have been shouting Michael's name for a while now and he is starting to prove his ability - and he beat me at the Indian Open," added Williams. "I always knew he had the talent to come through. The expectation has been on my shoulders for a while and you can't expect an old man like me to do it. We need some more young Welsh players to fly the flag."